My highlight of this year must be Intuitive Music Aberdeen's performance of my piece Drostan's Calendar in Montrose on St Drostan's Day, 15 December. This was the culmination of a process that involved making monthly recordings of the sea on the pebble beach at Aberdour throughout 2004, processing and filtering these recordings according to a series of modes, then creating intuitive music for live keyboard players to be played over the recorded material. In recent years I have had various conversations with promoters and venues with connections to the Drostan story about possible performances in Aberdeenshire, but none came to fruition, so I was very pleased to find St Mary's and St Peter's Church in Montrose, which has a stained-glass window depicting Drostan and was interested to host the premiere performance. 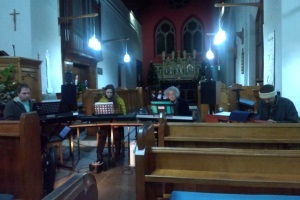 And so we gathered on a cold December night in this church, four performers and a small but enthusiastic audience, and the piece came to life for the first time. Intuitive Music Aberdeen has given performances of several other pieces of mine this year, ranging from a piece called Non-payment of wages, part of an Economic Suite composed jointly with other members of the group and played at St Andrew's Cathedral, Aberdeen, to a number of short pieces played at the William Lamb Studio in Montrose. My final performance of the year, also with Intuitive Music Aberdeen, took place at Better Read Books in Ellon on the winter solstice as part of the Solstice Shorts Festival, masterminded by Arachne Press in Greenwich. This festival created a wave of music, poetry and stories crossing the UK at dusk on the shortest day, with events at twelve different locations, beginning with us in Ellon and ending with Redruth in Cornwall. My piece Winter Solstice Again, the final part of Dundee Ambient, provided the framework for our Ellon performance, over which we read stories and poems that had been submitted from across the UK, and played intuitive music based on the solstice mode that runs through Dundee Ambient. Over the course of the year I have given a number of duo performances with the singer-songwriter Rebecca Dunn, in which we have gradually developed a piece that we have never given a title, a piece that has never been rehearsed and only ever happens in front of an audience. Our performances have also included versions of some of Rebecca's songs, for which I have improvised additional accompaniments. I have enjoyed playing with the Melting Pot Collective, a large and flexible pool of musicians from diverse cultural and geographical backgrounds, at events ranging from the Aberdeen Mela in Westburn Park to the Newton Dee Folk Festival at the Phoenix Theatre, as well as several events in tribute to the late John Mackie, who died at the end of 2016. At the Aberdeen Jazz Festival I played with the Melting Pot Collective's offshoot jazz band Lembo, a slightly surreal experience for me! Unusually, performances with Hidden Aberdeen Tours have mostly been indoors this year. I did provide some sounds for an outdoor walking tour at Halloween, but the main events I have created music for have been theatrical events at the Beach Ballroom and Inn at the Park, and a storytelling evening at Underdog. I should mention my unexpected silent performance at Aberdeen's Silver City Stories weekend. I was meant to be acting as stage manager for Phillip Cooke and Peter Davidson's opera The King and his Shadow, but I ended up playing the silent role of standard bearer in 14 performances in the Castlegate. 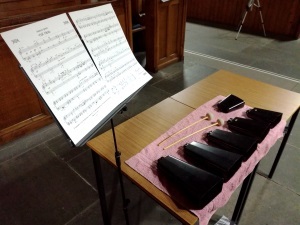 Another one-off performance was with organist Mark Spalding in Montrose, where I played cowbells in our organ-and-percussion version of Morris Pert's Cul Mor. It felt a little extreme to make a 130-mile round trip to perform just one two-minute piece in what was otherwise a solo organ recital, but it proved well worth the journey because it was at this event that plans for the Montrose performance of my Drostan's Calendar were hatched. 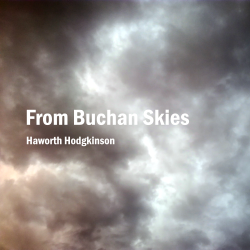 In parallel with my live performances, I have issued five new recordings of my music this year on the High Moss label. The first two of these featured environmental recordings, of a duck pond in St Andrews in Lade Braes and of birdsong and passing helicopters near my home in From Buchan Skies. The Arnage Sessions was built around a series of keyboard improvisations recorded in Arnage, interspersed with short pieces based on recordings of cats and blackbirds. The remaining albums, North Towards Ever and Three Proofs of Concept were archive recordings of pieces that have been waiting a few years for release, though North Towards Ever was extended a little in preparation for release. Most of my writing has been in private this year. I did write one new poem on National Poetry Day, and it was performed at two different events in Aberdeen on the same day, and some of my poems have appeared in Intuitive Music Aberdeen performances, including Skara Brae, which consists of 19 words on 19 separate pieces of paper and a scheme for arranging them into 210 lines of poetry. Two of my poems were published in The Granite Mile (Castlegate Arts), an anthology that came out of last year's National Theatre of Scotland Granite project. My main writing project of the year however has been a novel, based on memories of my student days, which I started as a short story at the beginning of January. It rapidly outgrew that status, and by the middle of the year it was clear that I had a fully-grown work of fiction on my hands. Much editing remains to be done, and I hope its completion may feature in my review of 2018... or perhaps 2019!